Way back in November of 2010 I wrote about how much I loved the Suzanne Collins novel The Hunger Games. Now, we are just a few days from the opening of the Lions Gate feature film based upon the novel. The Hunger Games will be the first big blockbuster of 2012. Many are predicting Twilight like ticket sales. I have made it clear that I plan to see the movie (a big step for me, as I really hate going to the movies). Recently, the question in my house has been, will I take my seven-year-old daughter to see the PG-13 rated film. Christopher J. Ferguson wrote an interesting piece about taking his 8 - year old to see the movie. Ferguson dispels the notion that violent films, television programs or video games lead to violent children or adults. Personally, I agree with Ferguson and respect his decision. As a parent I do not want to hide my children from everything. I would rather watch with them and be there to answer the questions I know they will have. My daughter is an advanced reader and has expressed an interest in reading The Hunger Games. I really see no problem with her going to the film or reading the novel. She and her younger brother have both watched all of The Harry Potter films (with some of them being rated PG-13). Ferguson says it best when he states, "Parents are free, of course, to use their moral compass to decide which media is appropriate for their families, but some of my own research suggests that the best option is for parents to consume violent-themed entertainment alongside their children rather than to either shield kids from it or leave them on their own." I remember watching a Friday the 13th movie as a fourth or fifth grader with my older cousins. Yes, I was scared to death, and yes as I entered middle school I became obsessed with seeing every terrible sequel to the Friday the 13th series. However, I swear to you I have never chased after anyone with a machete in my entire life (and have never had the desire to do so). I have no problem separating fiction from reality (although I must admit to killing many innocent citizens while playing Grand Theft Auto III for hours on my Playstation 2 years ago). 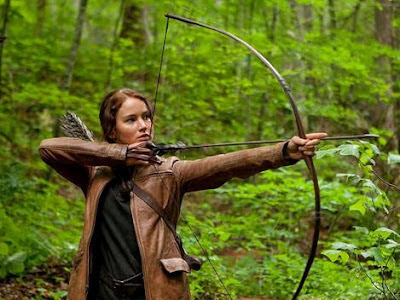 I think I can safely take my daughter to see The Hunger Games and not worry about her running around the neighborhood picking people off with a bow. I think parents should use their better judgments in letting their kids see this movie. The whole kids killing kids in a "Most Dangerous Game" kind of way makes me leery. I would personally draw the line at middle school. Any younger isn't a good idea. Again, this is just my opinion. I respect your opinion. Early reviews are calling the movie "soft" compared to the novel. I'm sure that's the case, because the studio wants to hit a large audience, so the violence had to be toned down from the book.